Purpose: Myotonic dystrophy type 1 (DM1) is often characterized by excessive daytime sleepiness (EDS) and sleep-onset rapid eye movement periods caused by muscleblind-like protein 2. The EDS tends to persist even after treatment of sleep apnea. We measured the cerebrospinal fluid (CSF) orexin levels in DM1 patients with EDS and compared the clinical characteristics with narcolepsy type 1 and idiopathic hypersomnia (IHS) patients. 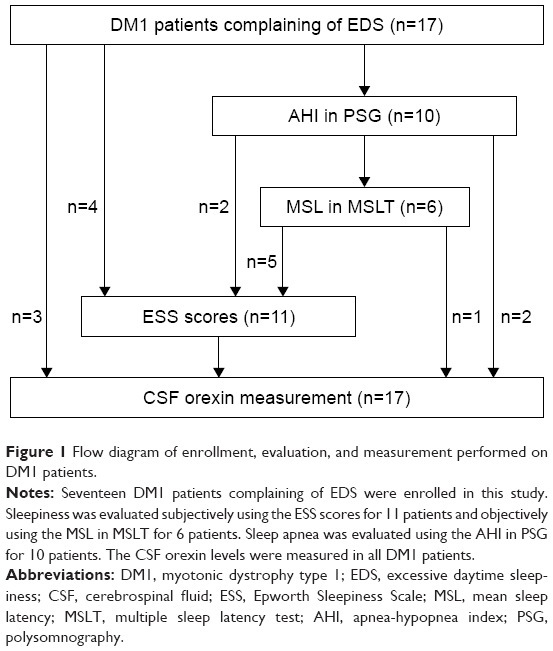 Patients and methods: We measured the CSF orexin levels in 17 DM1 patients with EDS and evaluated subjective sleepiness using the Epworth Sleepiness Scale (ESS), objective sleepiness using mean sleep latency (MSL), and sleep apnea using apnea-hypopnea index (AHI). We compared the ESS scores and MSL between decreased (≤200 pg/mL) and normal (>200 pg/mL) CSF orexin group in DM1 patients. Furthermore, we compared the CSF orexin levels, ESS scores, MSL, and AHI among patients with DM1, narcolepsy type 1 (n=46), and IHS (n=30). Results: Seven DM1 patients showed decreased CSF orexin levels. There were significant differences in the ESS scores and MSL between decreased and normal CSF orexin groups in DM1 patients. The ESS scores showed no significant difference among patients with DM1, narcolepsy type 1, and IHS. The MSL in DM1 and IHS patients were significantly higher than narcolepsy type 1 patients (p=0.01, p<0.001). The AHI in DM1 patients was significantly higher than narcolepsy type 1 patients (p=0.042) and was insignificantly different from IHS patients. The CSF orexin levels in DM1 patients were significantly lower than IHS patients and higher than narcolepsy type 1 patients (p<0.001, p<0.001). Conclusion: The CSF orexin levels of DM1 patients moderately decreased compared to those of IHS patients as the control group. However, the EDS of DM1 patients may not be explained by only orexin deficiency. Therefore, to further elucidate the role of orexin in EDS of DM1 patients, we verify whether orexin levels of DM1 patients differ from those of patients with narcolepsy type 1 and idiopathic hypersomnia (IHS), which is a disease with normal CSF orexin levels. We retrospectively analyzed data from 17 DM1 patients with EDS, 46 with narcolepsy type 1, and 30 with IHS that were previously collected to measure CSF orexin levels. All patients were Japanese. Written informed consent was obtained from all patients and/or their guardian(s). This study was approved by the ethics committee of Akita University Graduate School of Medicine. Figure 1 Flow diagram of enrollment, evaluation, and measurement performed on DM1 patients. Notes: Seventeen DM1 patients complaining of EDS were enrolled in this study. Sleepiness was evaluated subjectively using the ESS scores for 11 patients and objectively using the MSL in MSLT for 6 patients. Sleep apnea was evaluated using the AHI in PSG for 10 patients. The CSF orexin levels were measured in all DM1 patients. Abbreviations: DM1, myotonic dystrophy type 1; EDS, excessive daytime sleepiness; CSF, cerebrospinal fluid; ESS, Epworth Sleepiness Scale; MSL, mean sleep latency; MSLT, multiple sleep latency test; AHI, apnea-hypopnea index; PSG, polysomnography. PSG was performed using unipolar induction electrodes including electroencephalogram (C3-A2, C4-A1, O1-A2, and O2-A1), chin electromyogram, and electrooculogram (left eye-A1, right eye-A2). Airflow was measured by airflow sensors attached to the nose and mouth using the thermocouple method. The breathing movements were recorded by band sensors attached to the chest and abdomen using the piezoelectric method. The body position, snoring, and arterial oxygen saturation were recorded by body position sensors, snore sensors, and pulse oximeters, respectively. In each hospital, recorders such as The Neurofax EEG-1524 (Nihon Kohden Corporation, Tokyo, Japan) were used. Subjects were put to bed at 9:00 pm and awakened at 6:00 am. All evaluations were based on the criteria of Rechtschaffen and Kales.15 An apnea was scored when a >90% decrease in baseline airflow that persisted for ≥10 s was observed. A hypopnea was scored when a 50%–90% decrease in baseline airflow associated with arousal, awakening, or <3% decrease in arterial oxygen saturation was observed. AHI was defined as the total number of apneas and hypopneas per hour of sleep and was defined as severe (>30 times/h), moderate (15–30 times/h), and mild (5–15 times/h). MSLT was performed following PSG. MSLT naps were evaluated 4 times at 9:30 am, 11:30 am, 1:30 pm, and 15:30 pm, respectively. Sleep latency was determined by identifying the latency to either 3 consecutive epochs of stage 1 sleep or the first epoch of any other stage of sleep, and MSL was calculated from the sleep latency of each nap. SOREMPs were defined as the onset of REM sleep ≤15 min of sleep onset. Data were reported as mean ± standard deviation or median (25%–75%). Student’s t-test was used to analyze the differences in the ESS scores and MSL between decreased and normal CSF orexin groups among DM1 patients. Since CSF orexin levels, MSL, and AHI did not show homogeneity of variances, the differences among patients with DM1, narcolepsy type 1, and IHS were analyzed using Kruskal-Wallis test. When the p-value in Kruskal-Wallis test was statistically significant, Mann–Whitney U test was performed to compare groups. Mann–Whitney U test was followed by Bonferroni post-hoc test. All analyses, along with the calculation of two-sided p-values, were performed using IBM SPSS statistics version 24, and the significance level was set at p<0.05. Seventeen DM1 patients with complaints of EDS (8 males, 9 females) and aged 14–70 years, with mean of 39±18 years, were included in this study (Table 1). The CSF orexin levels decreased in 7 out of 17 patients (cases 1–7). These patients were included in the “decreased CSF orexin” group while the others were included in the “normal CSF orexin” group. Four patients from the decreased CSF orexin group had low levels of orexin, including 2 undetectable levels (<40 pg/mL), and 3 had intermediate levels. In 8 patients who had used NIPPV, their subjective complaints of EDS were not fully ameliorated following therapy, and the ESS scores and MSL were evaluated after the treatment with NIPPV. The ESS score was >10 (mean: 13.6±4.7) in 9 out of 11 patients whose data were available. The MSL was <8 min (mean: 9.1±6.4) in 3 out of 6 patients whose data were available. The AHI of 10 patients were: severe (>30 times/h) in 5 patients, moderate (15–30 times/h) in 2 patients, and mild (5–15 times/h) in 1 patient, and the mean was 32.8±29.2 times/h. Three patients exhibited SOREMPs in MSLT, and 1 patient exhibited increased amount of REM sleep in all-night PSG (33.2%); however, their CSF orexin levels were all normal. Notes: To analyze the differences in the ESS scores and MSL between the decreased and normal CSF orexin groups, Student’s t-test was used. *One patient exhibited increased amount of REM sleep (33.2%) in all-night PSG. Abbreviations: DM1, myotonic dystrophy type 1; CTG, cytosine-thymine-guanine; ESS, Epworth Sleepiness Scale; MSL, mean sleep latency; CSF, cerebrospinal fluid; SOREMPs, sleep-onset rapid eye movement periods; AHI, apnea-hypopnea index; PSG, polysomnography; NIPPV, noninvasive positive pressure ventilation; BMI, body mass index; REM, rapid eye movement; T2-HIA, high-intensity area on T2-weighted magnetic resonance images; N/A, not applicable. In the decreased CSF orexin group of DM1 patients, the mean ESS score and MSL were 12.3±7.3 and 11.0±12.8 min, respectively. In the normal CSF orexin group of DM1 patients, the mean ESS score and MSL were 11.8±4.0 and 8.2±3.2 min, respectively. Differences of the ESS scores and MSL between decreased and normal CSF orexin groups were insignificant among DM1 patients (p>0.05). When comparing among patients with DM1, narcolepsy type 1, and IHS, the median of the CSF orexin levels were 205 pg/mL (139, 239), 42.5 pg/mL (40, 58.8), and 292 pg/mL (242.3, 361.5), respectively. The ESS scores were insignificantly different. 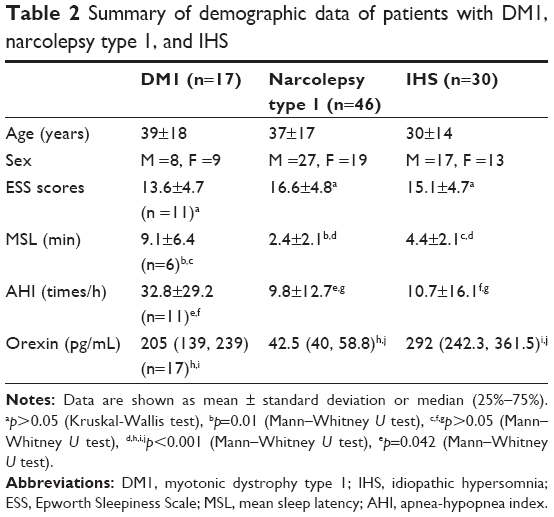 The MSL of patients with DM1 and IHS was significantly higher than that of patients with narcolepsy type 1. The AHI of DM1 patients was significantly higher than that of patients with narcolepsy type 1, and showed no significant difference to that of IHS patients. 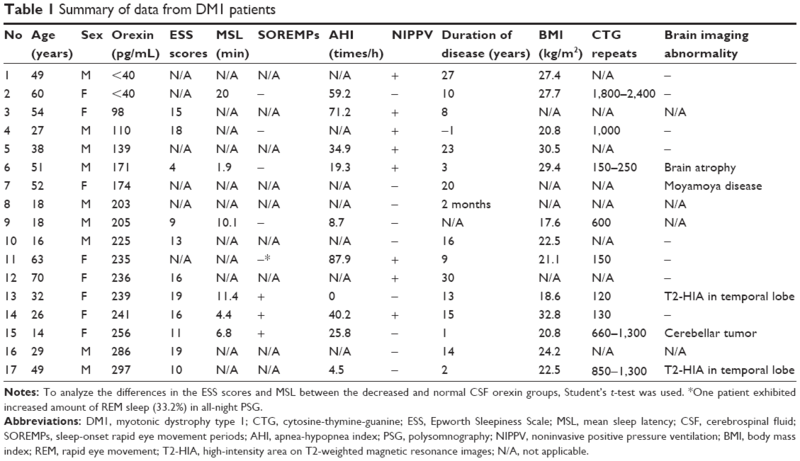 The CSF orexin levels of patients with DM1 were significantly lower than those of patients with IHS and significantly higher than those of patients with narcolepsy type 1 (Table 2, Figure 2). Notes: Data are shown as mean ± standard deviation or median (25%–75%). ap>0.05 (Kruskal-Wallis test), bp=0.01 (Mann–Whitney U test), c,f,gp>0.05 (Mann–Whitney U test), d,h,i,jp<0.001 (Mann–Whitney U test), ep=0.042 (Mann–Whitney U test). Abbreviations: DM1, myotonic dystrophy type 1; IHS, idiopathic hypersomnia; ESS, Epworth Sleepiness Scale; MSL, mean sleep latency; AHI, apnea-hypopnea index. 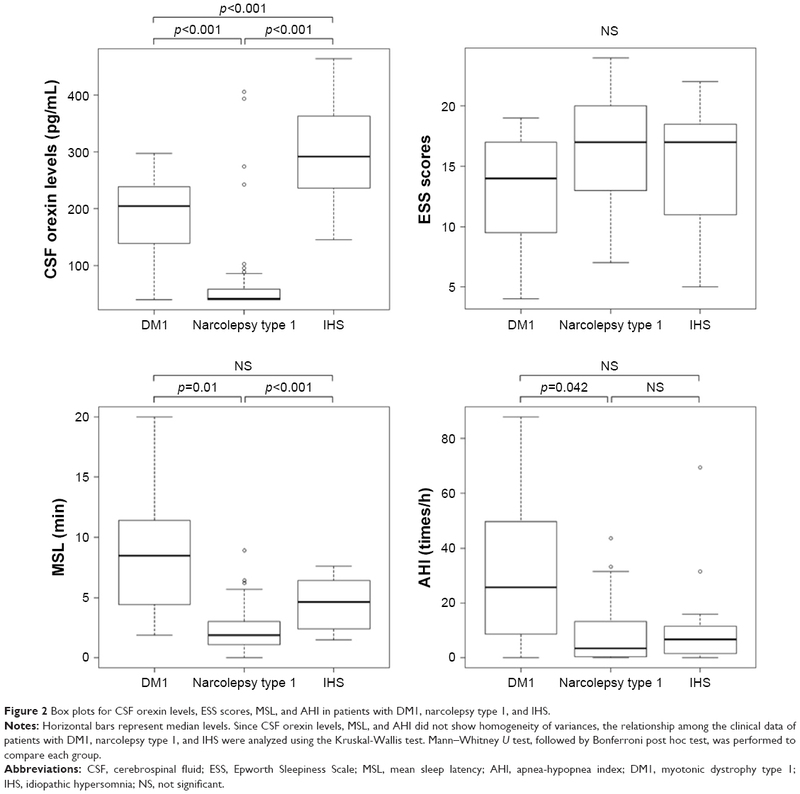 Figure 2 Box plots for CSF orexin levels, ESS scores, MSL, and AHI in patients with DM1, narcolepsy type 1, and IHS. Notes: Horizontal bars represent median levels. Since CSF orexin levels, MSL, and AHI did not show homogeneity of variances, the relationship among the clinical data of patients with DM1, narcolepsy type 1, and IHS were analyzed using the Kruskal-Wallis test. Mann–Whitney U test, followed by Bonferroni post hoc test, was performed to compare each group. Abbreviations: CSF, cerebrospinal fluid; ESS, Epworth Sleepiness Scale; MSL, mean sleep latency; AHI, apnea-hypopnea index; DM1, myotonic dystrophy type 1; IHS, idiopathic hypersomnia; NS, not significant. The CSF orexin levels of DM1 patients were significantly higher than those of patients with narcolepsy type 1 and lower than those of patients with IHS (considered as the control group with normal CSF orexin levels). Meanwhile, when comparing the sleepiness evaluations, the ESS score of DM1 patients was equivalent to that of patients with narcolepsy type 1 and IHS; however, the MSL of DM1 patients was significantly higher than that of patients with narcolepsy type 1 and IHS. These results suggest that the EDS reported by DM1 patients may not reflect the true sleepiness, because EDS of DM1 patients could include fatigue. Cytokines such as interleukin-6 (IL-6) are increased in DM1 patients,24 and IL-6 induces the sensation of fatigue.25 DM1 patients possibly experience fatigue, which is misinterpreted as EDS. Therefore, the features of the EDS reported in DM1 patients are not consistent with those of patients with narcolepsy type 1 and IHS, and orexin deficiency may not be the major factor of EDS in DM1 patients. In this study, 3 patients with normal CSF orexin levels exhibited SOREMPs, and 2 of them were accompanied by short MSL. Besides, 1 patient with normal CSF orexin level had increased amount of REM sleep in all-night PSG (case 11). Some DM1 patients have been reported to exhibit SOREMPs and short MSL9,10 and increased REM sleep.9 Although the associations among CSF orexin levels, short MSL, and SOREMPs are unclear, the presence of REM sleep-related abnormalities in 4 out of 7 patients, which was confirmed by detailed PSG or MSLT findings, is interesting. Studies on the mouse model of DM1 have already demonstrated the role of MBNL2 in REM sleep dysregulation,1,26 and the relationship between the underlying mechanism and orexin nervous system should also be investigated. Reports of SDB are common in DM1 patients with EDS. In this study, AHI of DM1 patients was significantly higher than that of patients with narcolepsy type 1, that is, the influence of SDB on EDS in DM1 patients could not be completely excluded. However, the EDS of DM1 patients with SDB has been reported to lack improvement even after adequate therapy,8 and a considerable number of DM1 patients with EDS do not have SDB. Thus, SDB alone would not be the cause of EDS in these patients. However, methods to reduce the influence of SDB should be explored. This study has several limitations. Firstly, the number of DM1 patients with EDS included in this study may be too small. However, since the ESS scores and MSL of decreased and normal CSF orexin groups were similar, we could not conclude that orexin deficiency was a major factor in the EDS of DM1 patients. Consequently, more number of cases and prospective studies are needed. Secondly, clinical data concerning EDS, such as the ESS scores and MSL, were not available for some of the patients. Thirdly, since the ESS scores, MSL, and AHI of DM1 patients were not evaluated both before and after the treatment of SDB, the precise degree of influence of SDB could not be assessed. CSF orexin levels were reduced in DM1 patients with EDS. In patients with DM1, their CSF orexin levels were not associated with the results from subjective or objective sleepiness evaluations, and features of their sleepiness seemed to differ from those of patients with narcolepsy type 1 or IHS. Although DM1 patients exhibited decreased CSF orexin levels, orexin deficiency may not be the major factor of EDS. Fatigue caused by cytokines, such as IL-6, may be perceived as sleepiness in these patients. The relationship between MBNL2-mediated REM sleep dysregulation and orexin nervous system should be investigated. We would like to thank Dr Hiroaki Nozaki, Takayoshi Shimohata, Yumi Sekine, Kumiko Yasui, Naoki Suzuki, Daisuke Sato, Nobuyoshi Fukuhara, Yoshikazu Takayanagi, Ayumi Nishiyama, Genki Mizukoshi, Konomi Shimoda, Aiko Yasuniwa, Keisuke Suzuki, Kazusa Katanoda, Tsubasa Tei, and Ako Fujii for providing the patient samples and clinical data used in this study. This study was funded by a Special Coordination Fund from the Ministry of Education, Culture, Sports and Technology (MEXT). Additional support was provided by the International Institute for Integrative Sleep Medicine, sponsored by the World Premier International Research Center Initiative, from MEXT, Japan. We would like to thank Editage (www.editage.jp) for English language editing. All authors contributed toward data analysis, drafting and revising of the paper, and agree to be accountable for all aspects of the work. Charizanis K, Lee KY, Batra R, et al. Muscleblind-like 2 mediated alternative splicing in the developing brain and dysregulation in myotonic dystrophy. Neuron. 2012;75(3):437–450. Kanadia RN, Shin J, Yuan Y, et al. Reversal of RNA missplicing and myotonia after muscleblind overexpression in a mouse poly (CUG) model for myotonic dystrophy. Proc Natl Acad Sci U S A. 2006;103(31):11748–11753. Hao M, Akrami K, Wei K, et al. Muscleblind-like 2 (Mbnl2)-deficient mice as a model for myotonic dystrophy. Dev Dyn. 2008;237(2):403–410. Wang ET, Cody NAL, Jog S, et al. Transcriptome-wide regulation of pre-RNA splicing and mRNA localization by muscleblind proteins. Cell. 2012;150(4):710–724. Suenaga K, Lee KY, Nakamori M, et al. Muscleblind-like 1 knockout mice reveal novel splicing defects in the myotonic dystrophy brain. PLoS One. 2012;7(3):e33118. Quera Salva MA, Blumen M, Jacquette A, et al. Sleep disorders in childhood-onset myotonic dystrophy type 1. Neuromuscul Disord. 2006;16(9–10):564–570. Guilleminaut C, Philip P, Robinson A. Sleep and neuromuscular disease: bilevel positive airway pressure by nasal mask as a treatment for sleep disordered breathing in patients with neuromuscular disease. J Neurol Neurosurg Psychiatry. 1998;65(2):225–232. Dauvilliers YA, Laberge L. Myotonic dystrophy type 1, daytime sleepiness and REM sleep dysregulation. Sleep Med Rev. 2012;16(6):539–545. Yu H, Laberge L, Jaussent I, et al. Daytime sleepiness and REM sleep characteristics in myotonic dystrophy: a case-control study. Sleep. 2011;34(2):165–170. Laberge L, Begin P, Dauvilliers Y, et al. A polysomnographic study of daytime sleepiness in myotonic dystrophy type 1. J Neurol Neurosurg Psychiatry. 2009;80:642–646. Martinez-Rodriguez JE, Lin L, Iranzo A, et al. Decreased hypocretin-1 (orexin-A) levels in the cerebrospinal fluid of patients with myotonic dystrophy and excessive daytime sleepiness. Sleep. 2003;26(3):287–290. Ciafaloni E, Mignot E, Sansone V, et al. The hypocretin neurotransmission system in myotonic dystrophy type 1. Neurology. 2008;70(3):226–230. Johns MW. A new method for measuring daytime sleepiness: the Epworth sleepiness scale. Sleep. 1991;14(6):540–545. American Academy of Sleep Medicine. The International Classification of Sleep Disorders. 3rd ed. Darien, IL: American Academy of Sleep Medicine; 2014. Rechtschaffen A, Kales A. A Manual of Standardized Terminology, Techniques and Scoring System for Sleep Stages of Human Subjects. Washington, DC: Government Printing Office; 1968. Nishino S, Ripley B, Overeem S, et al. Hypocretin (orexin) deficiency in human narcolepsy. Lancet. 2000;355:39–40. Nishino S, Ripley B, Overeem S, et al. Low cerebrospinal fluid hypocretin (orexin) and altered energy homeostasis in human narcolepsy. Ann Neurol. 2001;50(3):381–388. Kanbayashi T, Yano T, Ishiguro H, et al. Hypocretin-1 (orexin-A) levels in human lumbar CSF in different age groups: infants to elderly persons. Sleep. 2002;25(3):337–339. Mignot E, Lammers GJ, Ripley B, et al. The role of cerebrospinal fluid hypocretin measurement in the diagnosis of narcolepsy and other hypersomnias. Arch Neurol. 2002;59(10):1553–1562. Romigi A, Albanese M, Liguori C, et al. Sleep-wake cycle and daytime sleepiness in the myotonic dystrophies. J Neurodegener Dis. 2013;2013:692026. Heatwole C, Bode R, Johnson N, et al. Patient-reported impact of symptoms in myotonic dystrophy type 1 (PRISM-1). Neurology. 2012;79(4):348–357. Iwata T, Suzuki N, Mizuno H, et al. [A marked decrease of orexin in the cerebrospinal fluid in a patient with myotonic dystrophy type 1 showing an excessive daytime sleepiness]. Rinsho Shinkeigaku. 2009;49:437–439. Japanese. Yasui K, Saito T, Tatsumi M, et al. [A case of myotonic dystrophy type 1 with recurrent sleep attack and low CSF orexin level]. Rinsho Shinkeigaku. 2010;50(7):501. Japanese. Johansson A, Carlström K, Ahrén B, et al. Abnormal cytokine and adrenocortical hormone regulation in myotonic dystrophy. J Clin Endocrinol Metab. 2000;85:3169–3176. Robson-Ansley PJ, de Milander L, Collins M, et al. Acute interleukin-6 administration impairs athletic performance in healthy, trained male runners. Can J Appl Physiol. 2004;29(4):411–418. Sakai N, Charizanis K, Lee K, et al. Sleep phenotype characterization of muscleblind-like 2 knockout mouse, a central model of myotonic dystrophy. Sleep Abstract Supplement. 2016;39:A14–A15.